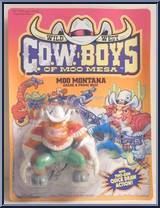 A champion among bulls, Moo Montana is the steadfast leader of the C.O.W.-Boys and Marshall of Moo Mesa. Straight shootin', courageous and quick on his hooves, Moos Montana battles the bad guys and makes the West a safer place to graze. This calm, cool and COWlected hero lives by the Code of the West and is as patriotic as MOOther's apple pie-and that's no BULL! Contribute pictures, update details or suggest corrections for Moo Montana. Write a review about Moo Montana.